Autumn, to me, means cosy nights in front of the fire, scary films, fireworks and orange leaves on the ground. It also means that I have an excuse to wear comfy jumpers and buy lots of new season coats in earthy hues. 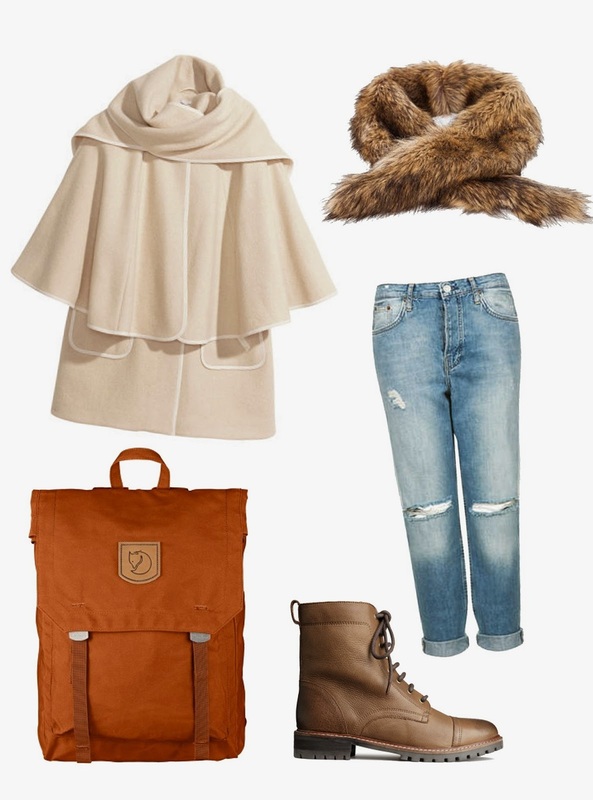 In my autumn wishlist I've featured this gorgeous cape coat from H&M in a soft beige colour. I love how the cape returns every autumn and this new take on the trend is definitely something i'll be investing in. Keeping with the earthy hues trend, how cute is this Autumn Leaf backpack from Fjall Raven? I think it goes perfectly with the faux fur collar from Missguided and leather boots from H&M. When's payday again? I need that collar- it's gorgeous! I really love the cape coat too, I really need to invest in one. Those Missguided jeans look EXACTLY like my Topshop Hayden Jeans!! Probably half the price as well!! I love this pretty wool coat! It looks so warm and cozy!